Editor's Note: There is one photo associated with this press release. President of UN Women National Committee Canada - Almas Jiwani, was honoured with the African Women in Leadership Organization (AWLO) Excellence Award. The Award Committee unanimously awarded Ms. Jiwani in recognition of her work towards women's empowerment and development in Africa. Under Jiwani's leadership, UN Women National Committee Canada has grown into a national organization of women and men working to support the overall UN Women mandate in its efforts to empower women and seek gender equality worldwide. The AWLO leadership conference was attended by African women leaders from across the continent in diverse field such as politics, legislature, business, commerce, and all spheres of life. The African Women in Leadership Conference (AWLC) 2013 was opened by Her Excellency, Deputy Governor of Akwa Ibom State. The conference was supported by the host nation, the Federal Government of Nigeria and the host state of Akwa Ibom. The First Lady, H.E Dame Patience Goodluck Jonathan, was ably represented by the Honourable Minister for Environment, Mrs. Hadiza Ibrahim Mailafia. The conference culminated in an Awards Gala Dinner where individuals who had impacted positively on the advancement of African women's leadership and empowerment were honoured. Nine awards were made in the area of their Commitment to Women's Empowerment, Women Changing Lives and Enriching Communities and Giving Women a Platform and a Voice. 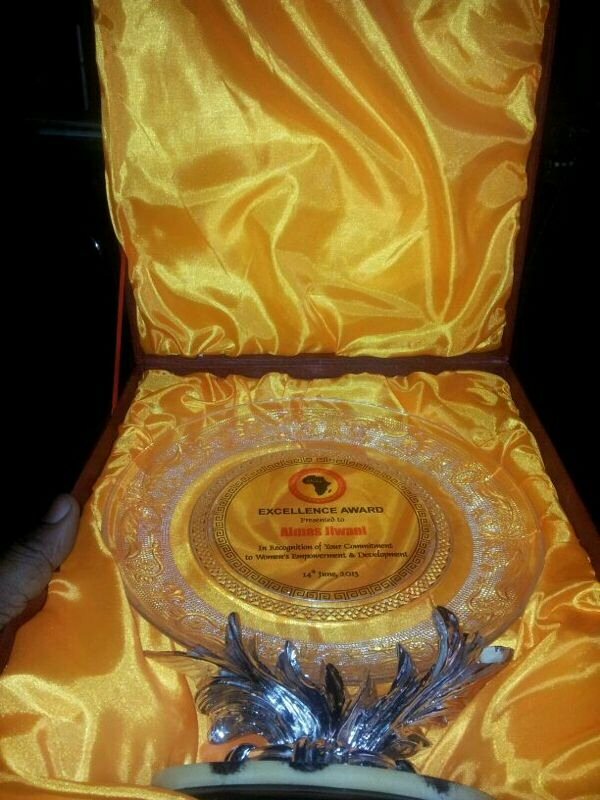 "I am honored to receive this recognition from African Women in Leadership Organization, an organization doing amazing things to inspire African women across the continent," said Almas Jiwani on receiving the award and added: "One of the biggest challenges facing African women is that they remain excluded from equal access to social and economic capital such as employment, political, financial and social/legal services. However, seeing the work UN Women has done in Africa gives me confidence that gender equality is not a distant dream for African women and girls today. UN Women, along with the support of National Committees worldwide and I will continue to fight for women and girls in Africa and across the globe until parity is achieved and the quality of life and opportunity is improved for many future generations to come." The 5th edition of the AWLC was held at the Le Meridien Ibom Hotel & Golf Resort, Uyo, Akwa Ibom, Nigeria from June 12 - 14, 2013 under the theme African Women Of Worth. UN Women National Committee Canada raises UN Women's profile and promotes its work in Canada; raises funds for UN Women projects; creates awareness within the Canadian governments for increased funding for UN Women projects; and encourages non-governmental organizations to promote and support UN Women initiatives (www.unwomencanada.org). The African Women in Leadership Organization (AWLO) is a non-profit organization whose members work to advance the status of women in Africa. AWLO projects and activities are focused around the areas that will improve the status of women in the continent. More information is available at http://www.awlo.org/.